How To Create Purposeful Organizations, from Frederic Laloux | Converge for Impact: Making Complex Collaboration Work. This post is a part of our series of Book Summaries, in which we synthesize and share the most insightful concepts from our favorite books. The following has been modified from Frederic Laloux’s Reinventing Organizations, 2014. This book helped to inspire and inform the self-management structure of Converge. Download our full 12-page summary of Laloux’s Reinventing Organizations here. “Can we create organizations free of the pathologies that show up all too often in the workplace? Free of politics, bureaucracy, and infighting; free of stress and burnout; free of resignation, resentment and apathy, free of the posturing at the top and the drudgery at the bottom? Can we create soulful workplaces – schools, hospitals, businesses and nonprofits – where we can shed our mask and where our talents can blossom and our callings can be honored? At both the top and bottom, organizations are more often than not playfields for unfulfilling pursuits of our egos, inhospitable to the deeper yearnings of our souls. They regularly separate the professional from the personal, and historically offices have been places where people must show up wearing a mask, expected to behave in certain pre-determined, acceptable ways. So what would it take to reinvent organizations, to devise a new model of “Tier 2 Organizations” that makes work productive, fulfilling and meaningful? Tier 2 Organizations are not structured along the typical control-minded hierarchical templates. They are complex, participatory, interconnected, interdependent and continually evolving systems, like ecosystems in nature. In an ecosystem, interconnected organisms are self-managed, and thrive without holding power over another. How high you reach depends on your talents, your interests, your character, and the support you inspire from colleagues; it is no longer artificially constrained by the organization chart. Self-management, just like the traditional pyramidal model it replaces, works with an interlocking set of structures, processes and practices; these inform how teams are set up, how decisions get made, how roles are defined and distributed, how salaries are set, how people are recruited or dismissed, and so on. Conflict resolution, for example is a foundational piece in the puzzle of interlocking self-management practices. It is the mechanism through which peers hold each other to account for their mutual commitments. The difference of self-managing Tier 2 Organizational models is that form follows need. Roles are picked up, discarded, and exchanged fluidly. Power is distributed. Decisions are made at the point of origin. Innovations can spring up from all quarters. Meetings are held when they are needed. Temporary task forces are created spontaneously and quickly disbanded again. When organizations are built not on implicit mechanisms of fear but on structures and practices that breed trust and responsibility, extraordinary and unexpected things start to happen. When trust is extended, it breeds responsibility in return. Emulation and peer pressure regulates the system better than hierarchy ever could. Take Buurtzorg (which means “neighborhood care” in Dutch), the organization that has caused a resolution in neighborhood nursing. Founded in 2006, Buurtzord has grown from 10 to 8,000 nurses in eight years, gaining 60 percent of the market share in the Netherlands. At Buurtzorg nurses work in teams of 10, with each team serving a well-defined neighborhood. The team is in charge of all the tasks that were previously fragmented across different departments, responsible not only for providing care but for deciding how many and which patients to serve. They do the planning, scheduling, administration, decide which doctors and pharmacies to reach out to, monitor their own performance and decide on corrective action if productivity drops. The teams are effectively self-governing and self-organizing. By changing the model of care, Buurtzorg has accomplished a 50 percent reduction in hours of care, improved quality of care and raised work satisfaction for their employees. FAVI – a successful brass foundry, AES – a global energy provider with 40,000 employees, and Morning Star – the world’s largest tomato processing company, are among the growing number of organizations that have embraced self-managing structures with outstanding success. For common structures of Tier 2 Organizations see the end of this article. Trust is the secret sauce of productive and joyful collaboration. If we want workplaces of trust, if we hope for deep, right, and meaningful relationships, we have to reveal more of who we are. The more you know about another person’s journey, the less possible it is to distrust or dislike that person. Organizations must weave a fabric of communal relationships that has resilience in times of crisis, resourcefulness in times of need. It’s a fabric that must be woven before the need or the crisis arrives, when it’s too late for community to emerge in the stress of the moment. To start developing an organizational community, you must strive to create a safe space that invites deep listening, authenticity and vulnerability. Train all colleagues in interpersonal skills to enable them to deal gracefully with conflict, bring nature into the building, install a kitchen where colleagues can cook and share a meal over lunch, start meetings with a round of check-in and finish with a round of check-out, and integrate peer-coaching practices. Remove symbols of status, allow colleagues to lead skill training programs infused with the company’s values and culture, and have recruiting & interview practices handled not by HR but by future teammates who simply want to decide if they would want to work with the candidate on a daily bases. Other innovative techniques include developing a company-wide “network map” that reveals which teams should have a conversation to improve their collaboration. Most existing models think of organizations as machines – inanimate, static systems whose direction must be steered by the CEO and his or her leadership team. In Tier 2 models, the organization is viewed as a living system, an entity with its own energy, its own identity, its own creative potential and sense of direction. We don’t need to tell it what to do, we just need to listen to the “evolutionary purpose” of the living organization, partner with it, and discover where it will take us. Rather than trying to predict and control, Tier 2 Organizations try to sense and respond. The traditional practice in organizations is to look five years ahead and make plans for the next year. Instead we should think like farmers: look 20 years ahead, and plan only for the next day. Making predictions gives us a comforting sense of control, but the reality is that organizations and the world we live in have become complex systems. In such complex systems it becomes meaningless to predict the future and then analyze our way into the “best” solution. When we do, we only waste energy and time producing an illusion of control and perfection. Instead, make peace with complexity and shoot not for the perfect solution but for a workable solution that can be implemented quickly. Based on experimentation & new information the decision can be revisited and improved at any point. In a self-managing organization, change can come from any person who senses that change is needed. This is how nature has worked for millions of years. Innovation doesn’t happen centrally, according to plan, but at the edges, all the time, when some organism senses a change in the environment and experiments to find an appropriate response. Some attempts fail to catch on, while others rapidly spread to all corners of the ecosystem. Strategy is no longer the domain of a few minds at the top, and implementation is no longer a mandate given to a few program managers. A whole organization is mobilized to sense into the future and help that future unfold. Self-Managing Team (small organizations – e.g., Converge): A small organization in any sector that can be run as a single, self-managing team. 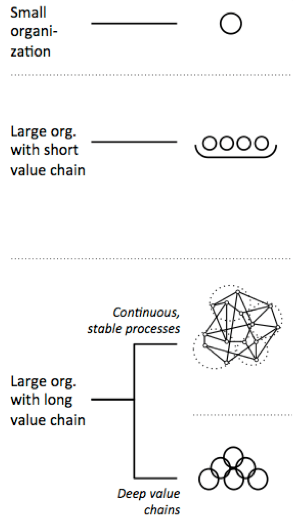 Parallel Teams (large organizations with short value chain – e.g., Buurtzorg, FAVI): This model is highly suitable when work can be broken down in ways that teams have a high degree of autonomy, without too much need for coordination across teams. In practice, there will often be a need for some people or teams who take on coordinating or supporting roles with a more narrow focus. Web of Individual Contracting (large organizations with a long value chain and continuous, stable processes – e.g., Morning Star): In this model roles and commitments are not discussed in teams, but between colleagues who work together. Commitments can then be formalized in a written document. This entry was posted in Book Summary, Culture + Teams, Think Pieces and tagged Culture, Purpose, Self-Management, Teams. Bookmark the permalink.